I enclose details of our legal guide to intellectual property and the internet. Cyberlaw: Intellectual Property in the Digital Millennium is the definitive guide to the revolution in copyright and other intellectual property law to accommodate the Internet! For nearly three hundred years, copyright laws have targeted those who illegally copy protected works. Now, however, the legal framework also takes aim at those who defeat protective technologies. Cyberlaw: Intellectual Property in the Digital Millennium is the definitive guide to the revolution in copyright law brought about by the need to protect against piracy and unauthorized copying on the Internet. You’ll learn how and when courts continue to apply earlier statutes and case law and when the law is wide open to lawyers’ creative arguments. This book explains the anti-circumvention and anti-trafficking rules of the Digital Millennium Copyright Act, the Act’s provisions for protecting copyright management information, and its attempts to reduce Internet service providers’ exposure to primary and secondary liability for copyright infringement. It parses the anti-trafficking rules and discusses in detail how several courts have failed to apply the rules correctly to complex technologies. It also explains how these rules derived from the emerging “federal common law” of copyright and how the still developing federal common law may make resort to these rules unnecessary. Cyberlaw: Intellectual Property in the Digital Millennium explains how the common-law rules of secondary liability for copyright infringement, as affected by the Supreme Court’s Grokster decision; work in the context of the Internet, and how statutory overlays have complicated their operation. Finally, the book discusses the background and origins of, and the treaties underlying, the Digital Millennium Copyright Act, as well as the Act’s substantive provisions, including the special subpoena power, the special cause of action for fraud and their relationships to state and other federal law. This book is updated as needed, generally up to two times each year. - 1.01 “Cyberspace Law”: A Premature Baby? I enclose details of our guide to internet and online law. Internet and Online Law, by an all-star team of legal experts, is the most comprehensive book in the field. This authoritative work describes the nature and growth of the law of the Internet and explains the legal obligations, opportunities, rights, and risks inherent in this complex medium. Internet and Online Law includes coverage of: negotiating enforceable contracts and licenses; identifying legal and business issues in electronic commerce; limiting liability for online defamation and factual misstatements; avoiding criminal obscenity or indecency charges; complying with government regulations affecting Internet and online services; and special aspects of procedure, jurisdiction and other litigation issues. The book also discusses the fundamental principles of the Copyright Act and the Patent Act relevant to online technology; regulatory and congressional reports on Internet telephony, universal service and access charges; privacy and encryption issues; and the impact of the Internet and other electronic means of communication on the obligations of issuers and other parties under securities laws. Contract issues explored include: application of common law; the U.C.C. ; the Statute of Frauds; parol evidence; and electronic and “shrinkwrap” agreements. Also covered are electronic signatures and authentication, trademark protection and domain names, legal consequences of owning a Web page or hosting a message board, and the value of warnings and disclaimers. This book is updated as needed, generally two times each year. Mr. Stuckey served as Director of Business Development and Vice President of CompuServe Ventures, Inc. and was General Counsel and Secretary at CompuServe from 1987 to 1995. He is currently CEO and Board Chair of Internet Transaction Solutions, Inc. He has played a key role in many leading cases and transactions, domestically and internationally, that have helped to define industry standards, business models and risk management procedures in the development of online and Internet markets. Mr. Stuckey is a member of the Board of Editors of many industry publications, speaks and publishes widely in this field and has testified before Congress on various online issues. In the past, arbitration, direct bargaining, the use of intermediaries, and deference to international institutions were relatively successful tools for managing interstate conflict. In the face of terrorism, intrastate wars, and the multitude of other threats in the post–Cold War era, however, the conflict resolution tool kit must include preventive diplomacy, humanitarian intervention, regional task-sharing, and truth commissions. Here, Jacob Bercovitch and Richard Jackson, two internationally recognized experts, systematically examine each one of these conflict resolution tools and describe how it works and in what conflict situations it is most likely to be effective. Conflict Resolution in the Twenty-first Century is not only an essential introduction for students and scholars, it is a must-have guide for the men and women entrusted with creating stability and security in our changing world. Jacob Bercovitch is Professor of International Relations at the University of Canterbury, New Zealand. Visit his website at: http://www.posc.canterbury.ac.nz/people/bercovitch.shtml. Richard Jackson is Reader in International Politics at Aberystwyth University, United Kingdom. 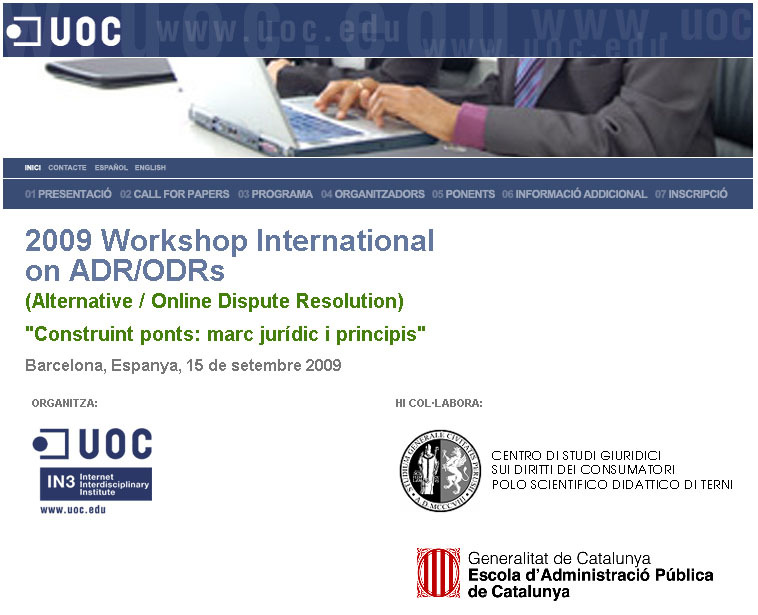 Workshop Internacional sobre ADR/ODRs Sede Central de la UOC 15 de septiembre de 2009 “Construyendo puentes: marco jurídico y principios”.